New Year’s resolutions don’t change much year to year. Last year I wrote researched 7 simple ways to Make and Keep Your New Year’s Resolution. Seriously, that’s all you need, so just click that link. The fact that you are still here is a good sign. It tells me that you have persistence or grit. This is important to succeed in any New Year resolution. Want to know how much grit you have? Bestselling author Angela Duckworth has a Grit Scale test. On the 0 to 5 scale, I scored a -37. Yikes. On the bright side, you can be confident that you are ahead of me. Get Financial Fit: The Ultimate Guide to Financial Freedom. I don’t use ultimate lightly. This is a fairly thorough guide. Be More Productive: Be Better Now: Productivity. Hint: Focus on the highlighted blue box. Personally, I’d pick one area (more than one is setting yourself up to overwhelmed) and read the specifics and jot down a few notes. Then I’d use the Make and Keep Your New Year’s Resolution article to set up a plan to keep motivated… which is the most difficult part. For months I’ve been crushing on Joe Udo’s blog, Retire by 40. 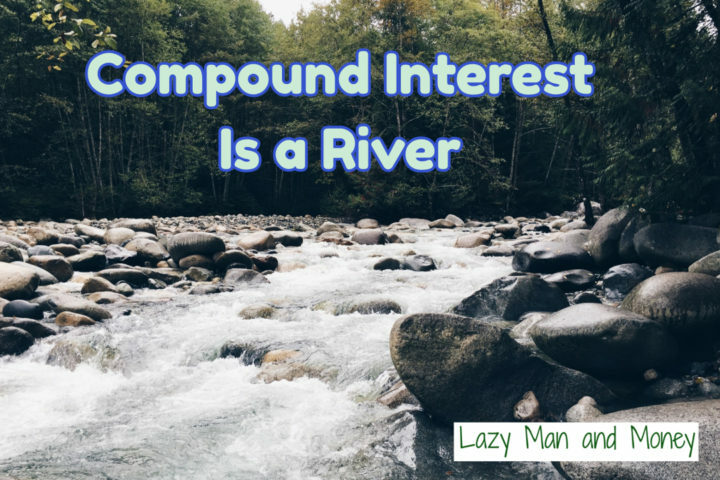 Perhaps I’m a little jealous as this blog’s initial goal was early retirement before I got sidetracked by a number of other interesting financial topics. One of my favorite topics of Joe’s is his financial independence journey. His “mile marker” is his financial independence ratio. Don’t know what a financial independence ratio is? You may remember it from 10th grade math class. It was usually squeezed in the 5 nanoseconds between the discussion of cotangents and the Mr. Rogers’ “number” i.
I feel like you could use a refresher. Your financial independence (FI) is your passive income divided by your expenses. If you make $1500/mo. from stock dividends and need $3000/mo. to live, you are half way to financial independence (FI)… an FI ratio of 50%. I would wager that 95% of the general public just read that as Charlie Brown’s teacher talking. Another 4% fit into my category, how do I begin to calculate numbers? (Maybe it is easier to go back to cotangents and imaginary numbers?) The last 1% are all set and ready to calculate the numbers. Let’s start with passive income… the numerator of the ratio. I think most people don’t have any passive income if they stopped working today. That’s a FI ratio of “goose egg” (zero). The Thompson Twins are likely collecting royalties which is a form of passive income. Maybe you have a pension. Maybe you have a huge nest egg in retirement accounts that you are looking to draw down on. Maybe you have investment properties that pay you an income each month. Maybe you have a small business that other people could manage. The other part of your FI ratio is your expenses… the denominator. If your Ferrari payment is $3000/mo. you are going to need a lot of passive income to cover it. Most people don’t know their expenses. That’s a shame because it’s as easy as using Personal Capital FREE web app. As I noted above, we have a few sources of passive income. In reality they are “potential” passive income sources. My wife is a few years away from her military pension. Our income properties are about 11 years of having the mortgages paid off… when the rental income starts to add to our passive income. We continue stuff our retirement accounts to defer taxes. I don’t typically count Social Security, but it is worth noting that it’s a source. As you can tell, passive income is difficult to quantify when it kicks in a few years. We could refinance the investment properties with 30 year mortgages to have some passive income now, but that’s against the long-term goal. On the other side of the equation is expenses. We still have the mortgages of the investment properties. We have a 2 and 3 year old with daycare commitments. The expense of kids change quite a bit over time. We can plan for them, but it doesn’t help for keeping a consistent financial ratio. We are in the process of paying off the mortgage in our own home (11 years left!). We are in the process of paying off our solar panels which will eliminate our electricity bills. We are half-way through paying off our new cars from a few years ago. Since we tend to drive our cars for 11-12 years, we’ll have some time where our expenses are zero. In short, there’s a lot of ebb and flow on both sides of the equation. We could go from 0% FI to 200% FI very quickly depending on the timeline. I’ve been officially old (big 4-0) for a few months now. It occurred to me that 40 year-olds have around 20 years of work experience (depending on high school, college, graduate school degrees). At first glance 20-years seems like a long time. No one wants to wait 20 years for something right? I thought the same thing until I realized that Summertime by The Fresh Prince and DJ Jazzy Jeff is 25 years old. We’re not even going back to Parents Just Don’t Understand. Time can sneak up on you. You are going to save some amount of money each year and invest it. The investment is going to earn 7% a year. While that number will vary, this 7% is generally accepted as a rate of return when investing in stock indexes. Yep, it’s $23,000. By the end of the 20 years you’ll have invested “only” $460,000. (We’ll get to the “only” in a bit). The investment gains will be $540,000**. When I did the math, the $23,000 number surprised me. Why? The maximum amount a person can contribute to a 401k plan is $18,000. The maximum a person can (typically) contribute to a Roth IRA is $5,500. If you were to max out both, you’d be saving and investing $23,500. To all the conspiracy theorists out there, doesn’t it appear that the government set these numbers because they want you to become a millionaire in 20 years? How Can I Save $23,000 a Year? Saving $23,000 a year can be easy for those with big incomes or an enormous challenge for those with small incomes. There’s no one “right” way to get that money to save. I think it’s best to work with a blended approach. The first thing I’d do is track your finances through Personal Capital. Many people are surprised to find out that their restaurant spending is several thousand dollars a year. You might be able to save a couple thousand dollars at restaurants with these tips. Next, I’d sign up with Digit Dobot. This free service takes a small amount of money out of your banking account and “hides” it in another FDIC insured account. The idea is that you won’t miss the money the money you don’t see. You can read my Dobot review here. I’ve saved more than $1000 dollars and I didn’t even notice. By now you are probably seeing that you may be able to save a few thousand here and there. It really depends on what you are already spending and what you are earning. Over 20 years you’ll probably need to buy a new car. You may be able to get a car that is cheaper and save yourself a hundred or two a month, which really adds up. Does saving $23,000 still sound like too much money? Get a spouse and you can cut the savings goal in half. Some may consider it cheating, but I think most people would consider a great joint accomplishment. When I got married I found that many expenses, rent, utilities, cable, were cut in half as I had someone sharing them. Looking for more ways to become a millionaire? 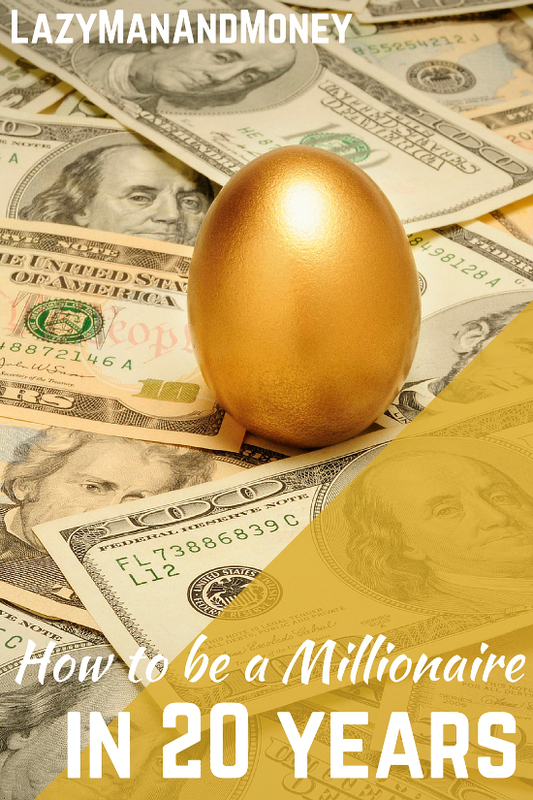 Here’s a lighthearted look at How to Become a Millionaire. Here’s the story of how one person became a millionaire in ten years. * When I was 23, I was introduced to a 27 year-old woman. I flat-out called her “old”. Perspective is a strange thing. Investment Expenses – These can be minimized with index investing. Inflation – A million in 20 years is likely going to buy less than it does today. On the flip side, it should be easier to save $23,000 in year 18 than in year 1. Taxes – This is a big one. I’m going to do what everyone else tends to do and suggest that this is in a retirement account and that there are no taxes when they are really just deferred. I think most people with a million dollars in their retirement accounts would call themselves a millionaire. Am I wrong? Every couple of months, I read an article about early retirement that knocks my socks off. This past week I read such an article and I’d like to share it with you. We have a similar story, so you might want to stick around after you read it. Here is Root of Good’s recap of their million dollar journey in 10 years. Before I get to our story, I’d like to shine a spotlight on what really worked for Justin. It feels weird analyzing someone else’s personal finances like this. However, I’ve detailed our estimated $200,000 in annual retirement income and have explained what’s working for me. Maybe this makes me qualified to give an opinion on someone else’s journey? While they did have two incomes, neither made close to six figures. At their peak, they combined to make $138K. That’s not to say that big income can’t work. It’s even easier. It’s just that big income is not a requirement. In this article, the frugality comes into play when they point out that they didn’t upgrade their starter home or their cars. These are typically the two largest expenses adding up to around 50% of spending. They all took vacations using bonus miles by signing up for credit cards. When you aren’t spending money, it becomes easy to save it. If that sounds too simple, perhaps it is because it really is that simple. My absolute favorite tool for saving money is Digit. (I reviewed Digit it here.) Digit is a FREE tool that squirrels small amounts of money from your checking account to a Digit account. That automatically builds an emergency fund. You don’t have to think about it and you’ll never notice the small amount of money being moved. In 18 months, I’ve squirreled away over $8000, but I’m extremely aggressive with it. It’s always a happy surprise to see a big chunk of money in that account. Digit is one of two tools that I think everyone should get. They poured the savings into the stock market and let it grow over ten years. Using a quick Rule of 70, if they even made 7% (which might be conservative), they’d have doubled their initial money. In two years, 2012-2013, savings and investment gains added over $500,000 to their net worth going from 697K to 1.24 million dollars. Let that sink in for a minute. A couple whose combined income (before expenses of 3 kids) was $138K grew their net worth by $500K in two years! You simply can’t do that by saving alone. They benefited by a very good stock market as the S&P 500 was up ~16% and ~32% in those years respectively. You can call it luck if you want. I’d rather focus on how years of saving prepared them well to take advantage of that stock market. They didn’t do any special stock picking or market timing. Sorry if you were looking for some fancy investment advice. Instead it was boring… slow and steady investing in index funds with low expense ratios. That’s what’s worked for me as well. I recommend Vanguard ETFs. As you can see from the charts, Justin tracks his net worth very regularly. I’ve done the same and I can’t express how much of a difference it has made. Over the years, I’ve gathered so many financial accounts (banks, credit cards, brokerages, mortgages, Paypal, etc.). I used to track it all with a spreadsheet, but I’ve found a better tool for the job. Personal Capital pulls in all your financial information securely from all your financial institutions and puts it in one place. You get great charts of your net worth, but it’s a lot more than that. You can see where your money is invested (large-caps vs. small-caps, international or domestic). You can also where you are spending your money via the categorization of credit cards. I couldn’t get this information my manual spreadsheet. Best of all, like Digit, Personal Capital is free. As you read through the article, you realize that Justin is extremely smart when it comes to personal finance details. Those small details add up over ten years. It started in year two with a real estate investment move that lead to a 100K net worth gain. Justin understands taxes extremely well. This article shows them saving lots of money in tax-deferred, retirement accounts. In the past I wrote, they also have a plan to get the money out by paying few taxes. The Root of Good plan to early retirement may not be for everyone. Not everyone wants to live as frugally as they do. If that sounds like you, you might want to look into making more money. Not everyone may have the ability to tax-defer so much of their income. There’s still a lot you can build on here. And so what if takes you 12 years to only have a million net worth instead of their 1.2 million in 10 years. You can live with that right? Personally, we’ve built a real estate component to our retirement plan. It was accidental, but the results have been very positive for our net worth. We initially bought the real estate at the wrong time. 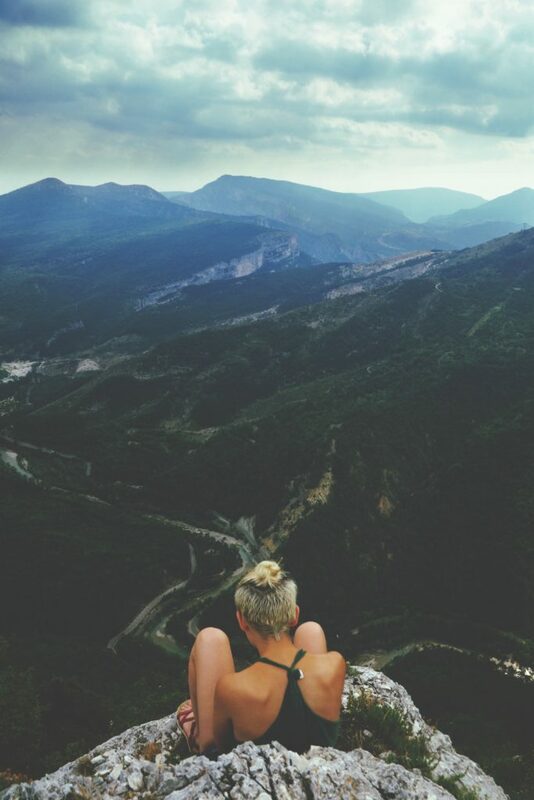 We intended to live there, but “life” changed our plans. We were able to refinance the properties and rent them out. It not only dug them out of the hole, but also helped get us to a point where they have equity. It is essentially the same idea as Root of Good investing in the stock market, but a different type of investment. It has more leverage and is more work. However, when the mortgages are paid off in a decade or so, we’ll have a sizable income stream. If you need any more inspiration, check out these 20 inspiring quotes by influential people.